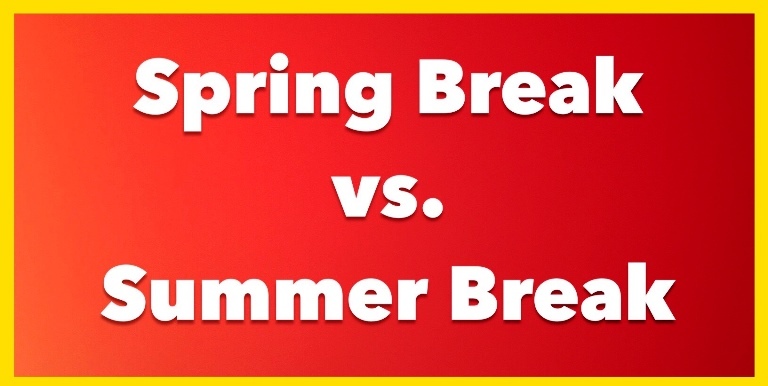 Spring Break or Summer Break - Which is Better? The Advantages and Disadvantages of visiting Disney World and Universal Orlando over Spring and Summer School Breaks. When is the best time to visit Disney World and Universal Orlando? Cooler temperatures and a much lower chance of rain are the biggest advantages to Spring Break. Averages highs range from 77 to 82 degrees and the average lows range from 57 to 62 degrees. This is so much easier on everyone, especially for very young and older guests, and will keep everyone feeling more energized. March or April will each get less than half of the rain that typically occurs in June. If you live in a colder climate where spring has not yet sprung, the warm sunshine and flowers of Florida are a real treat after the cold, winter blues. Spring can be too cool for some people to enjoy the water parks and it is always good to layer clothes if it is chilly in the morning or after dark. Bringing a sweatshirt or light jacket will save you from having to buy one in the gift shop if it is unseasonably cool. Check your 10-day forecast before your trip and remember that 60-degrees in a humid climate like Florida will feel cooler than in a dry climate. The Flower and Garden Festival at Epcot has food and fun for everyone, even if you don’t have a green thumb! Spring Break is a fantastic time to visit Universal Orlando! There are only two Universal parks and one water park so this fits well with Spring Break and even leaves time to head to the beach, enjoy some golf or shopping, or just relax at your resort. The nightly Mardi Gras parade, food and music are a fun and family friendly addition to Universal Studios for select dates in spring. Staying at an official Universal Orlando hotel adds nice perks like early access to the Wizarding World of Harry Potter and transportation to the parks; and there are even three hotels that provide the wonderful, line saving “Unlimited Express Pass” benefit at no extra cost. If you can’t imagine visiting Orlando without spending time at Disney World, we can easily add as many theme park days as your schedule allows. Because it gets dark earlier, nighttime “spectaculars” like fireworks happen earlier in the evening than in summer; this is nice if you have younger children or anyone in the family that wears out and would like to get back the hotel earlier. There is no getting around the fact that the crowds are heavy over Spring Break because it is consolidated into just three weeks for almost all of the schools in North America. The week around Easter is always the most crowded. Big crowds mean long lines so you definitely want to have good theme park touring plans to help you keep lines to a minimum. Our travel agents will provide good touring plans when you book your trip through us. Another disadvantage are Spring Break time constraints, especially if the drive to Florida will take two or more days. Some (evil) teachers assign papers or reading over Spring Break and kids in track may be expected to keep up their training. My busy kids were often kind of worn out by the time Spring Break rolled around and sometimes really needed a break that didn’t involve being at a theme park the moment it opened in the morning. On the other hand, some kids benefit from some fun and non-academic activity that gives them that last burst of energy needed to get through the rest of the year. You know your kids best! Because you’re not bound to one week, it is easier to do a longer trip in summer. This is nice if you need extra time to drive or if flights are cheaper on a week day and you need to off-set your trip so you aren’t traveling on the weekend. Disney and Universal both discount the cost of additional days on their admission tickets so you get more bang for your buck. Where the water park option isn’t always practical during spring break, it can be a great deal in the summer. My family likes water parks so we like to plan longer trips that allow full water park days instead of trying to squeeze in a few hours here or there. Most attraction refurbishments are done by the start of the summer season and most new attractions open early in the summer season though the new Star Wars land won’t open in Disney’s Hollywood Studios until late Fall 2019. Memorial Day, July 4th and Labor Day often let you enjoy one more day on your trip or use one less day of your valuable vacation time. Of course, you won’t be the only one to think of that. Memorial Day and the week of July 4th definitely experience a spike in crowds. This is less of a factor over Labor Day since many school districts now start school in late August. Heat and Rain: Hot temperatures can lead to hot tempers and the heat can be hard on the oldest and littlest members of the family. Arrive before park opening and take a break when the sun is high in the sky. June gets the most rain of any month in Florida and July isn’t far behind. You know that saying about not having sense enough to come in from the rain? Well, I have photos that I will never let you see where our family looks like drowned rats because we don’t mind the rain – it scares off the faint of heart and lets us enjoy shorter lines, rain also cools things off. Bring disposable rain ponchos – available at your local dollar store or in the camping section at Walmart – and pack quick-dry clothes so you don’t chafe. Crowds: Summer crowds aren’t as bad as spring break crowds because they’re dispersed over three months but they definitely are a consideration. June crowds tend to be pretty manageable and late August is always a low time. Expect peak crowds over Memorial Day and from June 25 – July 12. Arrive before the parks open and definitely use the theme park touring plans we provide when you book through us and you’ll have a great time. Disney Dining reservations can already be booked 180-days prior to arrival so you can start your planning very early in the year for your summer trip. Summer Discounts are released as early as January and are subject to availability. Your Disney vacation package deposit is only $200 and is refundable up to 30-days prior to arrival.